**Guest post written by Amanda Kenyon founder of Blue Crane Music, a New England based artist management, booking, and consulting service dedicated to helping musicians grow their careers. "Do you ever wonder how other people discover new music? YOUR music? We did. There are probably precise methods of surveying music listeners to answer that. But we’re musicians, not scientists. So we did what any modern day Joe would do to answer such a question: ask friends on social media. 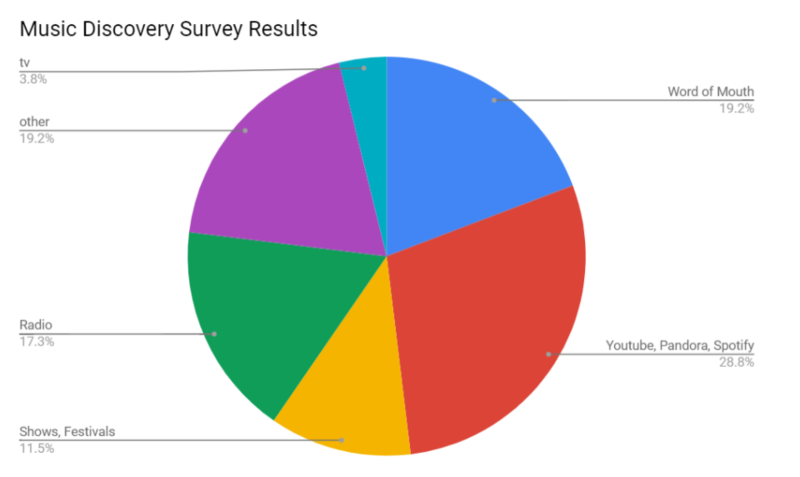 And here you have it, the unofficial survey results. While the percentages may not pass a statistical sniff test, it is directionally accurate, and probably confirms some of what you know or suspected. Or maybe sheds new insight. We hope you’ll walk away with at least one new idea of how to get discovered by new fans. There are MANY ways people find new music. Of those many ways, the internet takes the top spot. YouTube, Spotify, and Pandora were mentioned most. YouTube is the second largest search engine in the world. Make sure your channel has your best live recordings, and load up the descriptions with tags. Getting your music onto Spotify via a digital distributor is also pretty easy, but getting discovered by new fans on Spotify is harder. This article offers advice and a free ebook download from CDBaby. For Pandora, if you create an account you can submit your music for consideration here. Beyond the internet, people found good old-fashioned suggestions from friends and word-of-mouth to be great sources of finding new music. Make a good impression at your shows and create raving fans who will spread the word for you. Be well-rehearsed, critique your own performances, and seek audience feedback. It’ll pay off in free word-of-mouth marketing. Get onto multi-bills and gig-swap. This gives fans of the other bands a chance to check you out. Play at a wide variety of venues to reach new and different audiences. Make sure your studio and live recordings are of the highest quality. If one person absolutely loves what they hear, they’ll share it with friends and on social media. Also, radio is not dead! Local, college, and internet radio shows want your music, and people still do listen. Well, at the least the people we know still do. There are even people who discover music on TV and movies, with shows featuring performing musicians or soundtrack music that piques their interest. A good strategy is to have your music in many places, so that everyone has the chance to discover your music in the way that best suites their style. What’s your experience been? How does your music get discovered by new listeners? What new way do you want to try? Comment below!" +Is Posting Covers On YouTube the BEST Use Of Your Time?